As an Aries born on April 19th, your personality is defined by an appreciation for life, optimism and generosity. You are a people person and adventurer at heart, which are two qualities that may define you the most. You will never shy away from new experiences or people. While this is admirable in itself, it may be more impressive that you can always find the best in any situation. You apply the same optimistic world view to all aspects of life, which helps fuel your generosity. You are always willing to devote time, effort and energy for the well-being of a loved one. 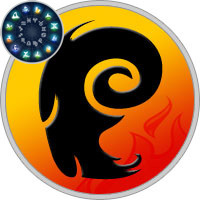 The Aries is paired with the fire element and of all the zodiac signs, you have the only fundamental connection with the element. Your special relationship with fire gives your personality the spark of a leader and self-starter. Similarly, it is fire’s influence that can be credited with your burning inner passion. Embracing fire’s qualities will allow your inner flame to burn with greater fortitude and focus. You should be weary of fire’s negative influence however, as impatience and impulsiveness is one of the greatest challenges of fire signs. Mars is the planetary ruler of your sign, but as you were born in the third Decan, or part, of the sign, you are also subject to the planetary influence of Jupiter. Mars, being the planet of assertiveness, is linked to your aggressive and vigorous personality, but it is the power of Jupiter that links to your generous, optimistic and truth-seeking qualities. Your unique combination of planetary power makes you the most knowledge-driven of all the Aries Decans. It is quite possible that you find yourself on a life long journey to obtain knowledge and understanding of the world around you. This quality will take you into the depths of spiritual thinking and allow your mind to take on its natural "dreamer" role. While your optimism and imagination are a great asset, try to focus on more realistic pursuits to keep yourself grounded. In love, find a partner that shares in your fun-loving nature, but does not take advantage of your generosity, as this will bring you the most happiness. An Aries born on April 19 is possessed with a deep sense of their own spiritual significance and has the ability to do great things. They have marked psychic ability. Whether or not they choose to make use of this talent, it serves as a method for them to make a majority of their intellectual decisions.